This is my very favorite all-white small teapot. It holds about 4 cups - perfect for a tea drinker for one or nice for a quick fast tea with a friend. It is isn't old or precious, but I just love it - and use it often without worry! It fits easily on any number of my trays. It matches so much. I am not afraid to take it outside to use, either. That's a nice feeling. If it should break I would be terribly sad and mad, but not devastated. (I risk devastating breakage whenever using my precious antique china tea sets, but by golly I have never been the type to wait for a better day.) I use, show, wash, love and even sometimes break my china. Yes I did type the word break. It happens. It happened yesterday actually. But I am over it! 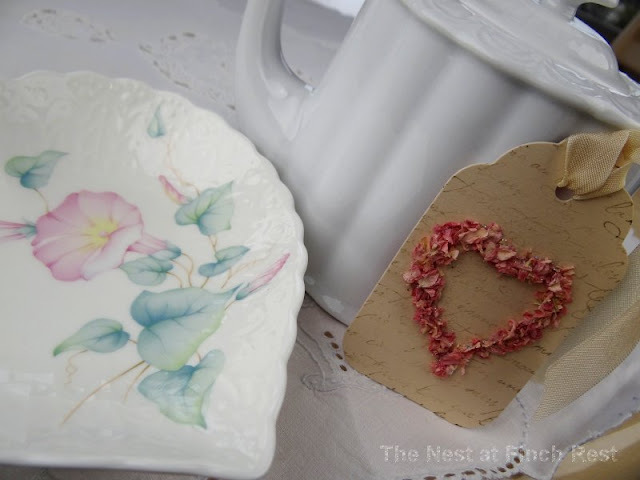 Life is too short to not use our pretty china! Why wait? Get it out of those cabinets and enjoy it while you are able! "Pretty is as pretty does" my Mom used to advise. And she was right! This is a sweet gift - a white heart-shaped Mikasa dish with pastel pink petunia and aqua leaves. You get a few peeks of a couple different cherished vintage embroidered or crocheted white doilies showing through. Here is the back of the dish just for you, a very special friend. Thank you for dropping by! 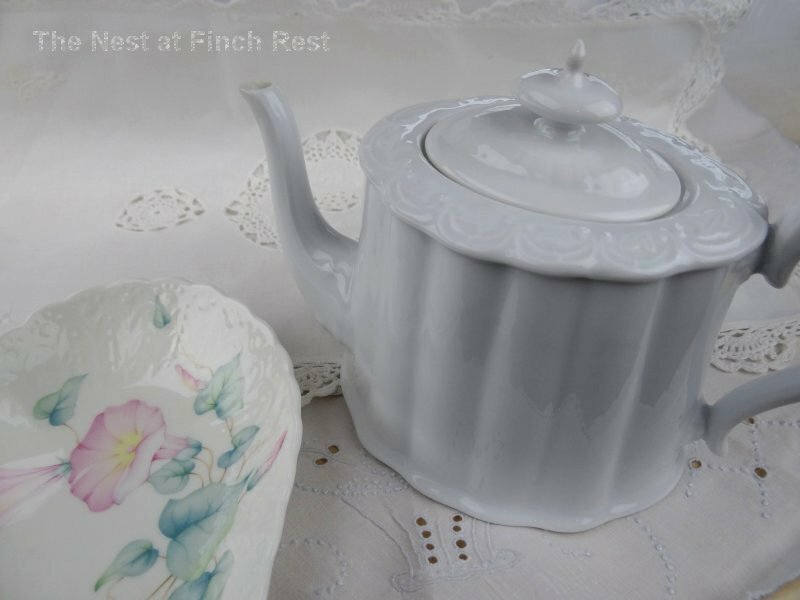 Heading on over to A Faded Charm for White Wednesdays to show off my fav white teapot! Such a pretty teapot, Michele! It has taken me a long time but since we have moved and it is just the two of us, I am more likely to use things that I was "saving", for what I don't know. When I happen to be having dinner on my own, I try to make sure I use a proper plate and not a paper one. Might as well use these things and get some enjoyment out of them! That is a pretty teapot-I have a chintz one the same shape.I agree we might as well enjoy our pretty treasures. Sorry you were feeling blue-it is hard to loss a good friend. It is fun to use our nice pieces rather than keep them in the cupboard. 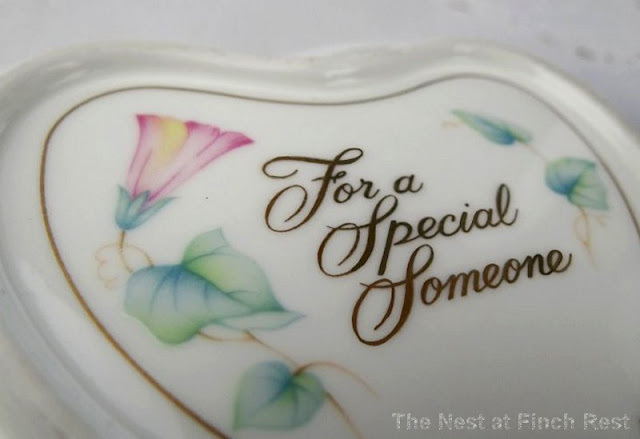 I always say things taste better when it's served on a favorite piece of china. Hello, I think there's nothing more charming than a white teapot! I have a couple and just love them. Thanks for visiting - I am now following so I might keep up with you too! I love that you use your china everyday! I don't have valuable china to speak of but I do try to use our nice plates for dining instead of paper plates. As you said, life is too short! I also use my good China but only on the weekends. Your white teapot is Beautiful. 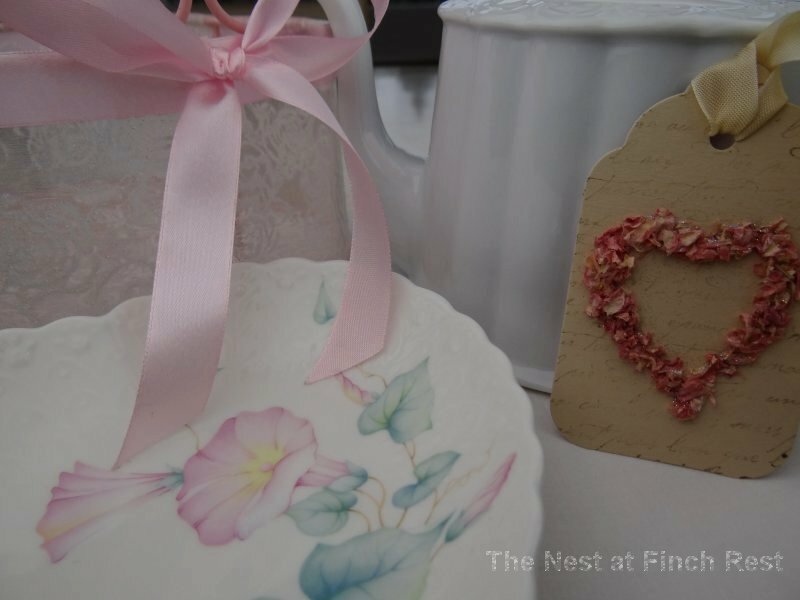 I would like to thank you so much for your sweet comments on my Valentine's Day Tablescape so sweet of you. Im your newest follower on your Blog now. I hope you can join my blog also. I just found your blog!! I love it! I am your newest follower! So enjoying your blog. You have just encouraged me to pull out my mother's china that I am saving for heaven knows what! Lovely pictures. I love old teapots, your right, use it now! White tulips for White Wednesday! Silly Pink for Pink Saturday! A wonderful tea book available!